I’d like to share it with you, the community, so that you may once more bask in the glory that is Junkyard Jump. In order to play the game, you’ll need to ensure that you have Adobe Shockwave Player installed (I still miss when it was Macromedia Shockwave ;_;) and you need to “Allow” it to run when prompted. You can enjoy the game by visiting the Retro section, or by clicking here. I did find a way to run the game without the “Fox Kids” pre-loader, but I decided to keep the loader intact for nostalgia’s sake, even though the break-out game isn’t functional. 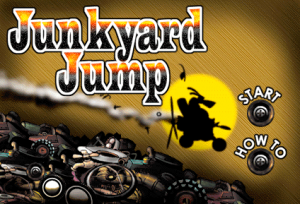 This game had a smaller game that loaded for you to play while you waited for the main game to load, in this case Junkyard Jump. Dial-up couldn’t even handle a 1 meg game without needing to give you a mini-game to bide your time. I don’t particularly miss 56k speed, but I do look back on it with a smile. If you’d like me to dig up another game from your childhood past that you can’t seem to find, feel free to ask in the comments. If you find any other glitches let me know so I may update this post. Junk yard jump game. You finally got it! It seems much different then when I played it though. Any possible way to get that digimon adventure game or mystic knights of tir ra nog? I think I can get my hands on the assets for the Digimon game, and I’ll look for the Mystic Knight game as well. Was the Mystic Knight game also a Fox Kids game? Could you try to get the Power Rangers in Space game from Fox Kids?? The one where you play with the red ranger on that “speeder” racing through space? It would bring so much memories.. Thanks! Sure, I’ll get right on finding it for you. Check back soon! you are the freaking man!! i remember playing this game back when i was in maybe 4th or 5th grade maybe 6th i forget but i remember trying to look for it a couple years back and couldnt find it, instead i found an article telling me that the site had been shut down along with all the game = (, this def brings back alot of memories !! !